When do you think the busiest day is for people making phone calls? If you said Mother’s Day, Valentines Day or even Christmas, you’d be wrong! Father’s Day is the busiest day of the year for people making phone calls. When it comes to sending dear old dad a card, it ranks number four--Mother's Day, Valentines Day, and Christmas all beat it. 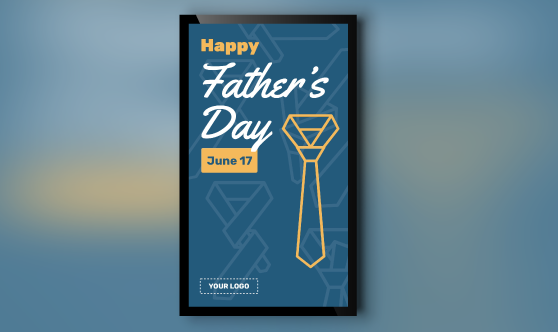 To help you remind your audience to give their dad a call, our Creative Team has come up with some new engaging digital signage just for Father’s Day. It can be added to your display in less than a minute. Watch the video below to see how, and then take a look at the templates below and add one to your display. Our Creative Team is adding templates for every major holiday, so make sure and check back often to give your digital signage a refreshing seasonal look.